emily lam | blog: Remember those goals? This summer felt perfectly paced. I guess that's because my mindset all summer was I miss Boston, I want to go back. So that longing gave me the sense of slowness. But then because I worked, had fun, and relaxed. I feel summer doesn't need to end yet – plus, I still have goals to finish. And the two feelings balanced out, so I neither feel this summer went by fast or slow. I had a Goldilocks summer. Anyways, I wanted to assess my summer goals before September starts. Okay, I didn't learn a skill. I didn't really try. But I did dabble in HTML so there was an attempt. I also worked at an engineering camp, so I honed my previous skills. I'm not sad at all that I didn't make this goal. =] I did make this goal. Check the post about it. Since, I was really vague about this goal – I didn't specify how many books I wanted to read or how much writing I wanted to write – I will deem this goal a success. I did read and write. All the writing I did is in this blog. So yeah, nothing impressive. What I read was also not impressive. I read the Hunger Games trilogy by Suzanne Collins. It's kind of like a merge of 1984 and Lord of the Flies. The first book was pretty good, it was believable, but it just went downhill from there. And it really started to drag by the end of the trilogy. I guess I judge a book in part by how well I can emerge myself in it. (Thought provoking is a plus!) Books, like the Hungers Games, really highlight how disgusting totalitarian governments can be. In that situation, I would probably go insane or not conform and be one of the ones they put down as an example to the rest. J. K. Rowling is right, we as human beings can imagine the situations of others. And we should use that ability to help the world. I will admit that I'm in a bubble, a bit naive, and that I don't realize how bad it is in some parts of the world. But that's something I personally need to work on. And I am optimistic about the human race. And that's all I read, book-wise. I know, weak. I failed this goal. Yeah, I only relearned one or two songs. =[ But at least I attempted right. Aw, well. I'll still hold on to the list. Maybe a new deadline, by next summer? This failure I am sad about. I failed. And I think this is the saddest failure of the three failed goals. And it's not because I didn't try but because every attempt was a failure. =[ But you know it wasn't all for nothing. I learned a bunch of things. As Thomas Edison once said: I didn't fail to make the incandescent lightbulb 1,000 times but learned 1,000 different ways to not make an incandescent lightbulb. (I couldn't remember the exact quotation, and google wasn't helpful, it was showing me multiple versions of the quotation. So I just paraphrased what I remembered in my head. Besides most people have heard of this quotation in some form.) 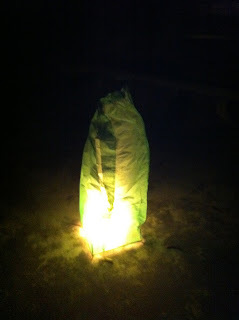 First, I want to say that I wanted to make a lantern without fireproofing the tissue paper, so a major challenge was preventing the lantern from catching on fire. Because my first two attempts caught on fire, I learned to line the bottom of the lantern, near the flame, with plastic tape. Plastic doesn't catch on fire, it melts. And on that note, because plastic melts, I learned to not seal the balloon part of the lantern with tape because when you light the lantern, the hot air will melt the plastic, therefore leaving holes in the lantern and letting hot air escape. Hot glue will also melt, but it won't leave holes and will also cause a stronger seal. And by all measures, I successful made a gleaming lantern. I like to sing to my little sister, "I've Got a Dream" from Disney's Tangled switching two of the words in Rapunzel's verse. Rapunzel sings, "I've got dream. I just wanna see the floating lanterns gleam." While I sing, "I've got a dream. I just wanna see my gleaming lantern float." (I know Martin Luther King Jr. had a dream about integration and mine is about a lantern. See what I mean about being in a bubble.) So why didn't my lantern float? It's too heavy. And I need more volume . . . so yeah. I might add more fuel too. I will try again today, in-between packing. But I want to leave you with a picture of my gleaming lantern.